This is probably the craziest truck racing championship on the Earth. The vehicles are alive, moreover, each of them has its own unrepeatable character. Are you ready to check all your skills and to prove that you are the best off road racer in the world? Then do not waste time and start playing this action game right now! 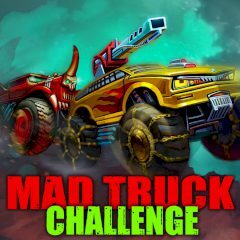 In this online action game your task is to drive a heavy truck along the off roads of different countries of the world, beat all opponents and come to the finish as quickly as possible. If you want to check your driving skills, the speed of your reaction and other abilities, welcome to this free arcade game which will not surely leave you indifferent. Are you ready? Then do not waste time and start your adventure in this online game.